1) No expensive buy-ins and no long term lease. A modest one time community fee, and a residency agreement providing resident and family flexibility on 30 day notice. 2) 24 hour nursing staff on premises. Not merely on call. A critical component for best care. 3) Life in the Park! Most communities are located next to busy streets. Anthem Lakes has a park-like 14 acre setting. Natural settings have been proven to be healing. 4) Pet friendly. Because pets can be part of the family - so Anthem Lakes has a dog park and even a pet grooming salon. 5) Unique memory care design: two different neighborhoods each with dual hallways creating internal walking loops, 9 to 15 foot ceiling heights, great nature courtyard, skylights, and more. Really worth seeing! For healthy, active seniors and older adults who value hospitality services; luxury amenities on a walkable 14-acre campus; lake and wildlife observation dock. Click here to learn more about this hidden jewel in Jacksonville, Florida. The best choice for assisted living in a natural environment. From medication management to physical assistance with daily living needs, never worry whether you or your loved ones are well cared for. Learn more here. Personalized to meet specific memory needs, from Alzheimer’s to other dementia-related diseases. A controlled access building, gardens, and activities that engage and stimulate mind and soul. Click to learn more. What's Right for You or Your Loved Ones? Click here for answers and help understanding terminology and types of care for active seniors and older adults who need support... or just make a phone call to the number above. Anthem Lakes is excited to announce a senior supportive independent living, assisted living and premier memory care community in the beautiful Atlantic Beach area of Jacksonville, Florida with accommodations for active seniors as well as older adults who need a little help, including those with Alzheimer’s and other dementia-related diseases. This unique location provides personalized senior assistive care in a natural setting on 14 acres of lush greenery, with wildlife, beautiful lake views and proximity to the local Jacksonville, FL beach communities. Our supportive independent living apartments combine convenience with amenities that ensure a better quality of life and few complications. There is a dog park to walk your beloved pet, a putting green to keep your game sharp, a fitness center to keep your body healthy, and so much more. If your health changes and additional assisted living or Alzheimer’s/memory care services are needed or desired, they are available and provided at our Jacksonville, Florida Anthem Lakes campus. We welcome your pets, your loved ones, your furniture and your smile! We are Veteran-friendly, and our compassionate, caring staff really sets us apart. Come visit our Jacksonville Anthem Lakes community, and let us help you enjoy the life you've earned. Give us a call today at (904) 513-2899 for more info and schedule a visit to learn why we are one of the most exciting senior supportive independent living, assisted living, and premier Alzheimer’s/memory care retirement communities in the Jacksonville, Florida area. Anthem Lakes in the Atlantic Beach area of Jacksonville, Florida Putting Green for our residents to keep their Golf game in top shape. 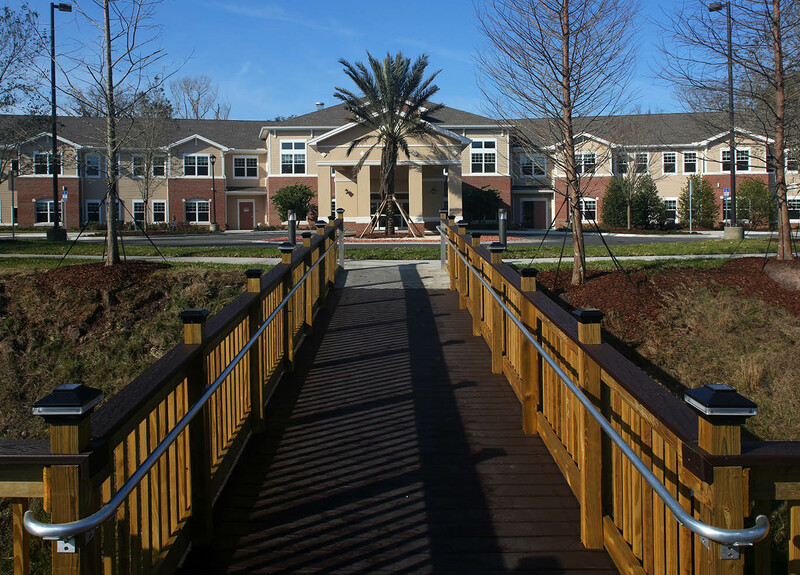 Anthem Lakes nature trail bridge, your gateway to an active walk with your trusted pet on our beautiful Jacksonville, Florida grounds. Anthem Lakes Jacksonville, Florida Senior Living Bistro. Enjoy your friends, great snacks and drinks. Take a look around our website to understand and compare what options are available at our Atlantic Beach senior living community in the Jacksonville, Florida area. There are plenty of photos to look at. You can also read reviews on Facebook or reviews on Google to see what others have to say and how living at Anthem Lakes retirement community makes our residents feel. There are also informative videos on YouTube about our senior community and recent activities and events. Supportive independent living, assisted living and premier Alzheimer’s/memory/dementia care in beautiful Jacksonville, Florida: these are all part of a spectrum of care that brings peace-of-mind to your retirement years. "The food is good and the people are so nice. I haven't met one that is not friendly or helpful. All of the residents are friendly. The staff is helpful. There are so many places to sit. Pets are welcome."